I first heard of this book many, many years ago, and it sounded intriguing. I had the title wrong, though–until I actually picked it up off a library shelf, I always thought it was Why Bad Things Happen to Good People. 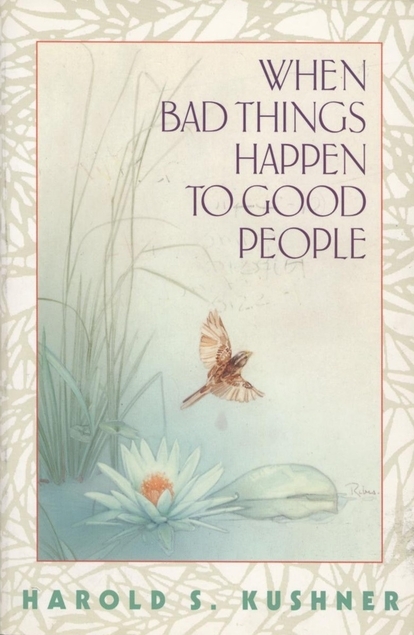 Now that I’ve read it, I think that title would have been too presumptuous for this thoughtful, philosophical book that doesn’t try to give easy answers: When Bad Things Happen to Good People by Harold S. Kushner. Written by a rabbi who lost a son to a degenerative disease, the book centers around how to face the terrible, inexplicable things in life, in the light of faith in a loving God. Kushner goes through the common explanations people often go to (tragedies as a form of justice, tragedies fitting into a larger plan, tragedies designed to teach us something…) This section includes an extended examination of the Book of Job. Kushner then, kindly, compassionately and compellingly, breaks down why none of those answers really work and, perhaps more importantly, are not really comforting in the greatest extremity. Kushner then offers his own conclusion, that God can’t rescue us from the consequences of our own choices, or from the effects of nature/natural law. He follows this with an exploration of why faith and prayer still matter and still help. He makes an important distinction between tragedy happening for a reason, and our own choice to create meaning out of a tragedy. He also suggests that prayer connects us to others who care, and gives us strength–praying for a miracle to change a situation usually doesn’t get us our desired result, but praying for courage to face the situation does. I don’t agree with everything Kushner said (the idea of an omnipotent God is so ingrained it felt very weird to me just to type that God can’t do anything) but he had many wonderful insights that really resonated with me. I think he approaches an extremely challenging life/faith/philosophy question with deep compassion. Some of his truths could feel hard, but they are offered gently. I also felt a deep sincerity in his writing, that right or wrong, he is offering the best answers he can find to an impossible question. And that, I think, is why the title Why Bad Things Happen to Good People would have been much too presumptuous. Kushner offers an answer, his answer, an answer that spoke to me quite a lot–but even with that, I didn’t feel like he came from an arrogant place of offering the answer to an age-old question. And I think that made his answer speak to me all the more. Kushner has written many other books, although this is his most famous, and I think I’ll look for some of his others. I’m particularly interested in Conquering Fear: Living Boldly in an Uncertain World. It seems unfortunately relevant! I’m glad I finally read this one–it was worth remembering the title all these years, even if I had it just a little wrong. I read this book years ago and still have it on my bookshelf, to refer to and reread as needed. I agree with your review and the points you make. Another reason I like the book so much is that I think it gives good insights to help a person comfort a friend or family member who is suffering when something bad happened to them.